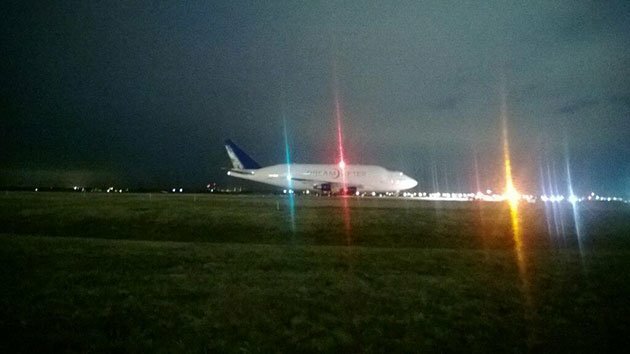 A Boeing 747 Dreamlifter cargo plane was heading for McConnell air force base in Wichita but instead touched down by mistake at nearby Colonel James Jabara airport in Kansas. Airport officials believe the plane will be able to depart despite the much shorter runway at Colonel James Jabara airport. An attempt is scheduled for lunchtime on Thursday. The aircraft normally needs a runway of 9,119 ft to get airborne at maximum weight; Jabara’s runway is only 6,102 ft long. Brad Christopher of the Wichita Airport Authority told the Associated Press news agency the company that operates the aircraft had “assured us they’ve run all the engineering calculation and performance and the aircraft is very safe for a normal departure at its current weight and conditions here”. The City of Wichita tweeted that no-one was injured and no property damage occurred when the plane landed.